This Thing Called Life! : You are Fabulous! I used this cute freebie Wryn from Tiddly Inks to enter a few challenges. I colored her up with my copics, cut her out with my Spellbinders label 25, inked around the edges, used some twine, a border punch and embossed the green paper with my cuttlebug folder. The sentiment "fabulous in every way" is from Some Odd Girl. I love the bright colors in your card - especially the flowers!! Your border punch adds a pretty touch! Thanks for joining us at Frosted Designs for our punch challenge! Wowwwwwwwwwwww! This is gorgeous!! I love love love love the colors and the flowers!!! 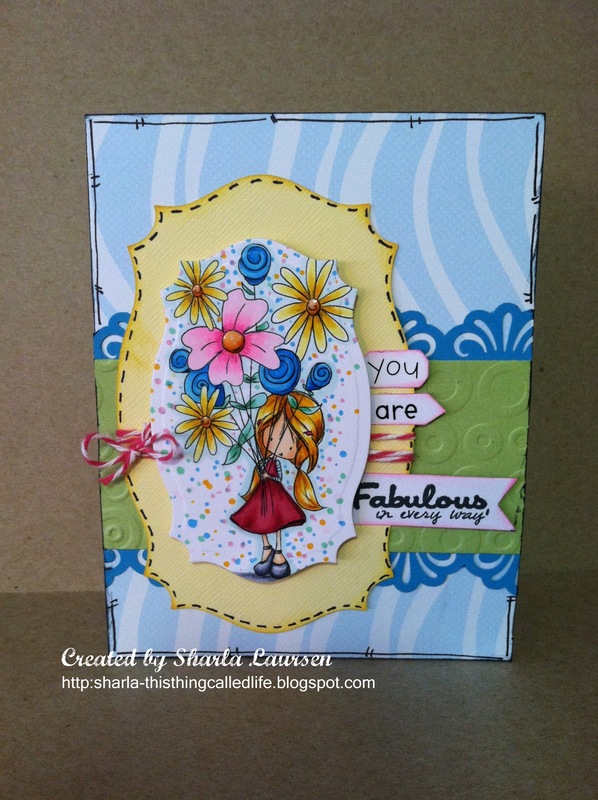 Your card is just fabulous! Great bright colors! Thanks so much for joining us at Tiddly Inks! sweet! Love those dots around the image. Thanks for joining the Tiddly Inks challenge. Beautiful card! The bright colors are wonderful and the image is so super cute! Thanks for playing at My Craft Spot! What a sweet card! LOVE the image and the bright happy colors! Thanks so much for joining us this week at My Craft Spot!!! This is adorable. Thanks so much for sharing your talents with us at Tiddly Inks. Good luck! Wow...how beautiful. The colors just pop!! Thanks for joining us at Frosted Designs!